Once again, Blaise finds himself chasing a manitou on Chapter 6 Page 26. Except this time, he’s outside at night in the snow. The advantages are all hers. 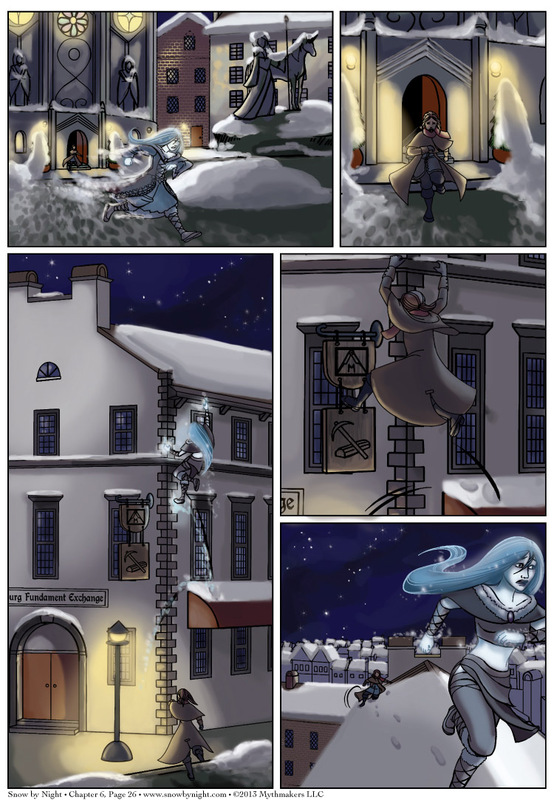 To see more of the chase, please vote for Snow by Night on Top Web Comics. This week, Snow by Night joined Tapastic. This is a webcomic hosting platform and it’s a way for us to try to reach new fans. Don’t worry, this site isn’t going anywhere. All my almanac entries are here. But if you would be so kind, please consider visiting Snow by Night’s series’ page and giving us a rating. The higher our rating and the more likes we get, the more prominently we’re displayed on Tapastic. Oh to only be in control of what I wear with a thought… You captured her transformation from formal to practical in excellent fashion. The gloves were real. I think it’s safe to assume that she dropped them in her flight out of the house. Whoever did that unicorn statue in the first frame didn’t really capture the true nature of Giavere. I know, everyone’s a critic. It might just be that Giavere isn’t fond of manitous . . . that may be exactly how she presents herself to humans. The priestess in the statue is larger than the goddess herself. Giavere a little pony? I think that the sculptor didn’t consult a real priestess who had real visions, but was trying to please a rich donor instead. Rather like the creche in front of the cathedral–all very cute and domesticated. Why was I under the impression that Snow doesn’t leave footprints on her namesake? Did we establish that? Here, I was thinking that she’s made of compacted snow so she would have weight to leave an impression in uncompacted snow (like on roof tops). Snow-by-Night can change her snow density at will, which is how she can drift down off of cliffs. Page 4/16 shows that my aging memory is again faulty, as she clearly leaves footprints. She erases their collective trail though, which is maybe what I’m remembering? Noticed the ‘Fundament Exchange’ in the background of panel 3. Looked up what Fundament meant. Yeah, keep on going down the list of definitions. The Fundament Exchange will be the subject of this week’s almanac.